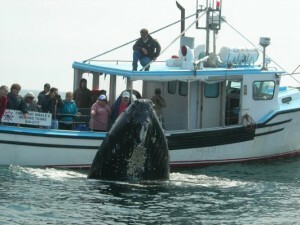 Freeport Whale & Seabird Tours is a family owned business started in 1994, and operated by Tim and Karen Crocker. We are located in Freeport, Long Island, NS on the Bay of Fundy, which is known around the world for its high tides and it’s many different species of marine life. During the summer months we are visited by Humpback Whales, Fin Whales, Minke Whales, endangered North Atlantic Right Whales, Sei Whales and Blue Whales. We also see Harbor Porpoise, North Atlantic White Sided Dolphins, Common Dolphins, Grey Seals and Harbor Seals. Seabirds number in the hundreds with daily sightings of Puffins, Shearwaters, Storm Petrels, Gannets, Kittiwake, Terns, Phalaropes and more! Every tour with us is guaranteed to bring you close encounters with these mammals and birds. Each trip is 3-4 hours long and fully narrated by professional guides. You will experience the Bay of Fundy at its best! And we never miss a stop at our local Grey Seal colony with seals numbering in the 100’s! Come on down to beautiful Long Island, enjoy great hospitality and an exciting and informative whale watching adventure. This is truly a maritime experience you won’t soon forget! Copyright © 2019 Freeport Whale & Seabird Tours. All Rights Reserved.